If you’re lucky enough to be pregnant during Halloween, these pregnant Halloween costumes, designed especially for couples and groups, will provide you with some really cool ideas on how you can make the most of your belly. Most of all, you can get your loved ones involved, too (after all, you’re in this together…)! Valarie wasn’t planning to dress up for Halloween with a 7-month belly, but her husband found this idea online and convinced her. 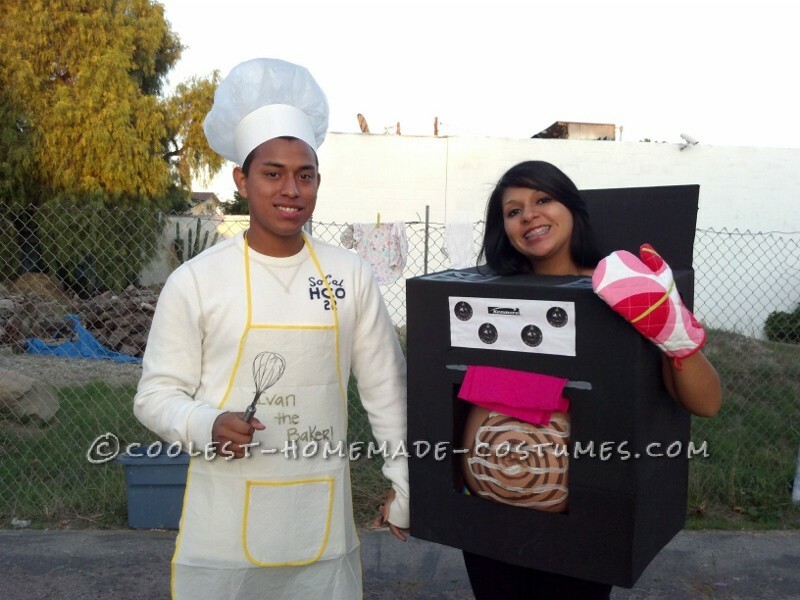 Valarie made the Bun in the Oven costume from items around the house and the only purchased item was her husband’s apron. Sarah and her husband came up with this original idea and began piecing the items, mostly from thrift store finds. The gold coins for this Pot o’ Gold Costume are actually plastic gold poker chips hot glued onto the fabric. 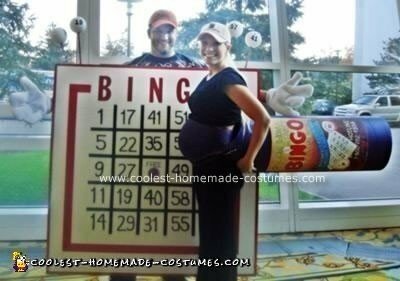 It was Wendy’s last planned pregnancy and she and her husband decided to make the most of it during Halloween. Once they nailed the idea – the Pregnant Housewife and Milkman, Wendy went to work and pieced together all the accessories. Her favorite part of the costume was the bright red lipstick marks she left all over the collar and Milkman’s shirt. “This costume is so special to me because it was fun, it allowed my husband and me to team up together and show our children how husbands and wives can have fun at Halloween,” adds Wendy. The theme of Liz’s party was “famous people throughout history”, and right away she knew that her pregnant belly would be perfect on Mary and her husband would be the perfect Joseph. Alisha found a creative and witty way to announce her pregnancy through your Halloween costume. Her twins were 15 months old at the time and she knew they’d be Thing 1 and Thing 2. 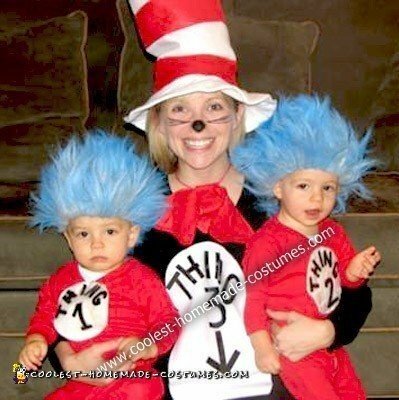 So, she turned herself into The Cat in the Hat and her 14-week belly into Thing 3. 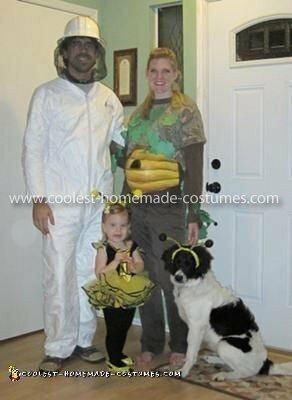 Elizabeth’s entire family took part in this bee-themed costume, including the family dog! 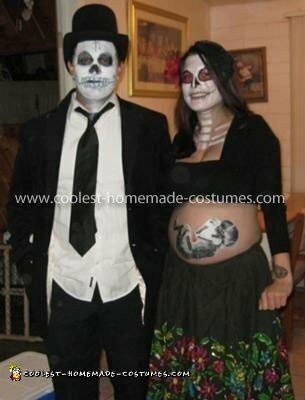 Emily and her husband went to a costume contest at a nearby casino and won first place for their original pregnant Halloween costumes. 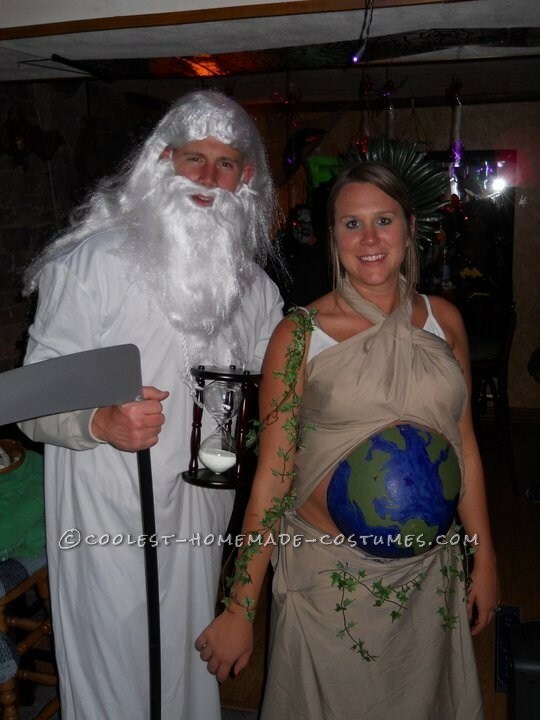 It took Ashley’s husband over an hour to paint the earth on her belly (including a few “earthquakes” resulting from the baby’s kicking) for their awesome Mother Earth and Father time costume. But it was well worth it and got lots of great compliments.